불랑기자포(佛狼機子砲)는 불씨를 손으로 점화·발사시키는 화기로는 조선시대 유일한 후장식(後裝式) 화포이다. 불랑기는 15세기 포루투칼을 포함한 서구제국에서 만들어져 1517년경 중국 광동지역에 서역상선이 들어오면서 전해졌다. 우리나라에는 조선 선조 25년(1592)에 명나라 군대가 가지고 들어왔다고 알려졌으나 이 유물이 발견되어 명종 때 이미 사용되었음을 알 수 있게 되었다. 불랑기자포는 발사틀 구실을 하는 모포(母砲)와 실탄을 장전하여 모포에 삽입·발사하는 자포(子砲)로 나누어진다. 전체적으로 몸통이 길고 포구(砲口)쪽이 가는 형태이며, 몸통 윗부분에는 가늠쇠가 있고 포구 위쪽에 가늠자가 달려있다. 원래 바퀴는 없었으나 고종 5년(1868) 신헌(申櫶)에 의해 4바퀴가 달린 마반차를 개발·사용하였다. 임진왜란 때 평양성 탈환에 널리 활용되었으며 신미양요(1871) 때는 미국의 군함에 맞서기 위해 초지진과 황성보진에 배치되기도 하였다. 오랜 동안 지하에 묻혀 있었지만 완전한 형태로 발견되어, 우리나라 화포사 연구는 물론 국방과학기술문화재로써 중요하게 평가된다. Bullanggi Japo Cannon is the only breech-loading gun as the kind of gun that is ignited and fired by hand with live fire origin. It was made in the several West European countries including Portugal in the 15th century, and was transferred to Asia when the trading vessels from the western countries reached Canton, China around 1517. It was heard that the army from Ming Dynasty of China had brought this gun to Joseon in the 25th year of King Seonjo, Joseon Dynasty (1592), but it is estimated that the gun had been used already during the reign of King Myeongjong in Joseon by the discovery of Bonjapo (name of a gun) as evidence. This gun is consisted of the main gun barrel that has the role of launcher and the powder chamber where the live ammunition was loaded, passed to the main barrel, and then fired. The general feature of this gun has a long barrel with narrower muzzle. The front sight is set on the upper barrel, and the gun sight is set on the upper muzzle of the gun.It had no wheels originally, but a wagon with 4 wheels was developed for the field use by Sin Heon (1810 - 1888) in the 5th year of King Gojong. 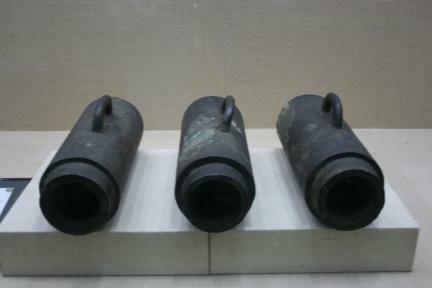 This gun was widely utilized for the recovering operation of Pyeongyang Fortress during the Japanese Aggression in 1592, and was deployed to the Chojijin Fortress and the Hwangseongbojin Fortress to fight against the American warships during the Sinmiyangyo (Foreigners' Aggression in the year of Sinmi) in the 8th year of King Gojong, Joseon Dynasty. It had long been buried in the ground, but was found in a perfect condition. Therefore this gun is evaluated as the valuable historical material of the national defense technique to study the history of local firearms.